The Cosmosphere is a world class space museum and a Smithsonian Affiliate. 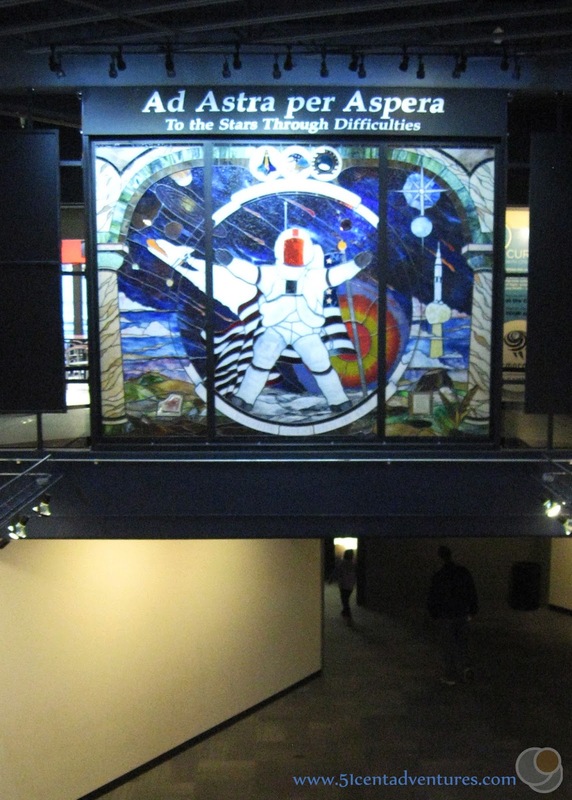 The Hall of Space Museum contains extensive exhibits displaying hundreds of space exploration artifacts dating back to World War II. 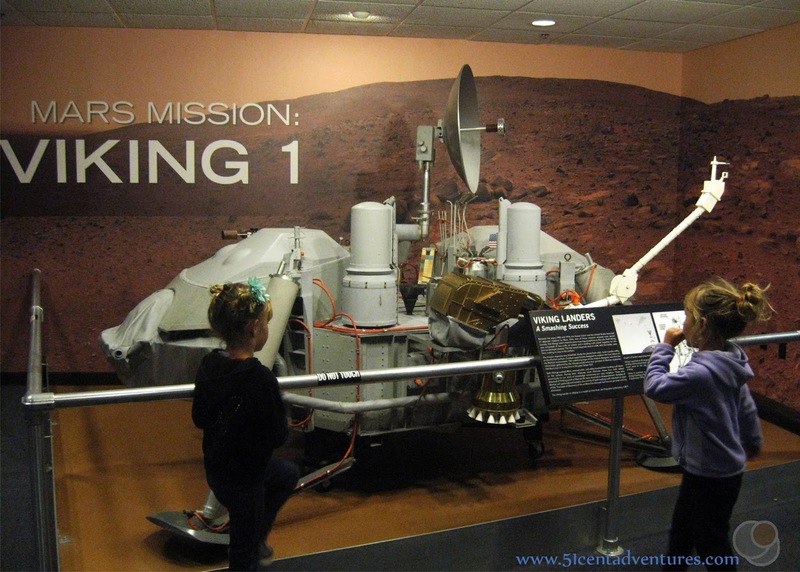 Signature displays include the Mercury era capsule the Liberty Bell, and the Apollo 13 Command Module Odyssey. The museum also has a small moon rock on display. 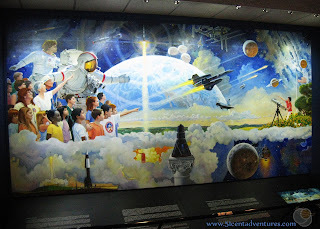 In addition to the Space Race era displays the Cosmosphere also has a movie theater and a planetarium. 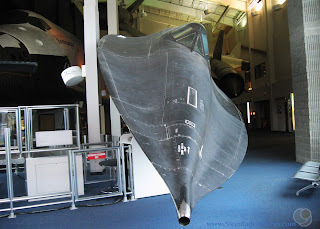 As if all that wasn't enough there is an actual SR-71A Blackbird on display in the lobby. Cost: Tickets for the Hall of Space Museum part of the Cosmosphere cost $13.50 for adults and $10 for children over three. Children under three are free. There is also a movie theater in the Cosmosphere. Tickets range from $6 to $15 depending on what you want to see. There are various combo ticket options. Operating Seasons and Hours: The museum is open every day except Thanksgiving Christmas, and Easter. Hours are from 9:00 am to 5:00 pm Monday through Thursday, from 9:00 to 7:00 on Friday and Saturday, and from noon to 5:00 on Sunday. 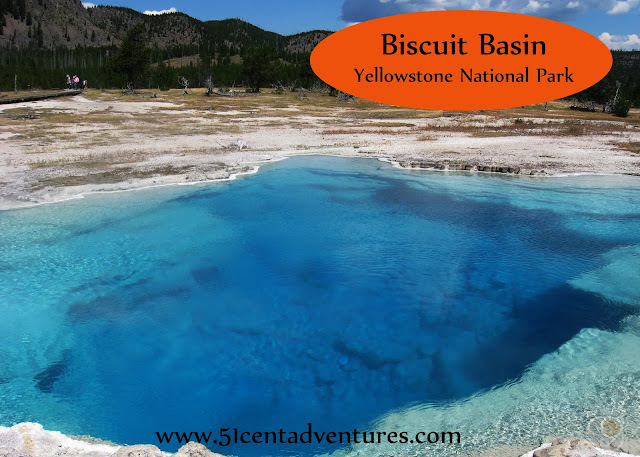 This was the first stop of the third day of my family's road trip when we moved from Alabama to Utah in November of 2016. We'd visited the Little House on the Prairie Museum near Independence, Kansas and then drove an additional 3 hours to our hotel in Hutchinson. In the morning we ate breakfast at the hotel, re-packed the car, and drove a few blocks to the Cosmosphere. We didn't think there would be a parking spot for our moving van so we left that parked behind the hotel. When I first started planning this road trip, I assumed we would spend most of our time in Missouri and Colorado. I didn't think there would be anything of interest in Kansas so I just planned to hop on the interstate and blow through that state in one day. However, that quickly changed when I started reading the guidebook that I ordered from the Kansas travel department. Many things in the state caught my interest. The Cosmosphere was one of those things. This is a Smithsonian Affiliated space and science museum. It's full of NASA artifacts. What caught my eye was the fact that the Apollo 13 Command Module is on display here. I love the movie Apollo 13, but I'd never realized that you could actually see the Command Module. 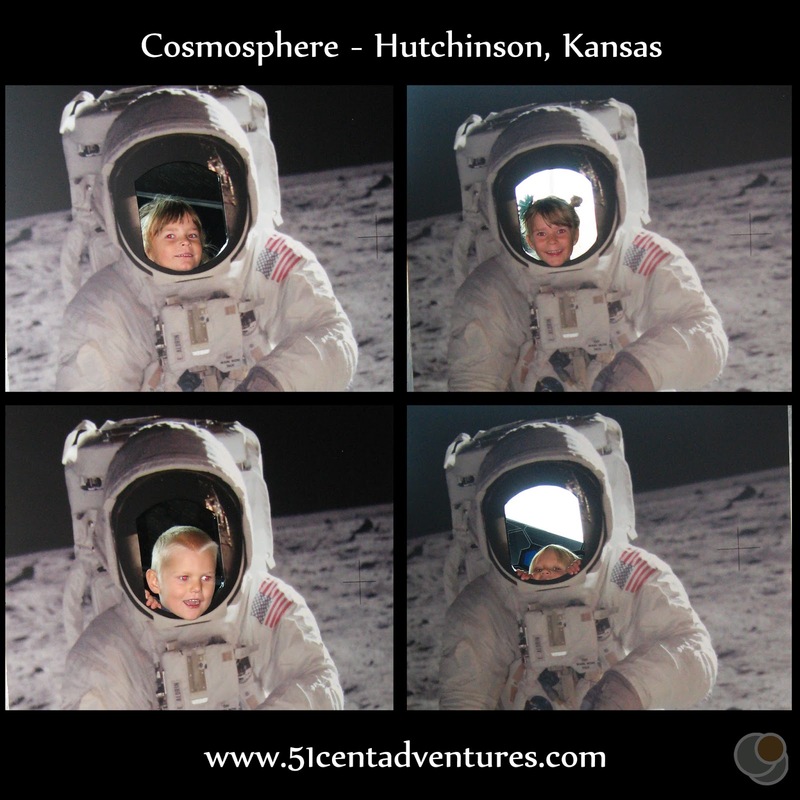 Stopping at the Cosmosphere immediately became something we had to do on our road trip to Utah. When we arrived at the Cosmosphere, I had two questions about the Cosmosphere that I wanted answered. 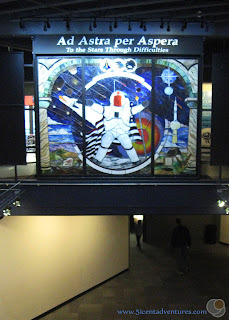 The first question was why this world class museum was located in a place that I'd never heard of - Hutchinson, Kansas. Look at a map, Hutchinson isn't even located along an interstate. It's half an hour northwest of Wichita. My theory was that maybe some part of some rocket had been manufactured here. 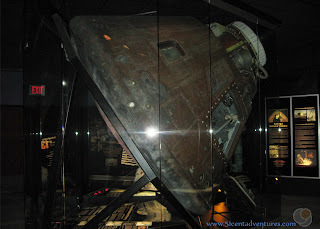 My second question was why was this place chosen to display the Apollo 13 Command Module? Was one of the crew of the ship from Kansas? Was the Command Module built here? The answers to these questions were not what I expected at all. And honestly, the answers were way cooler than I could have imagined. 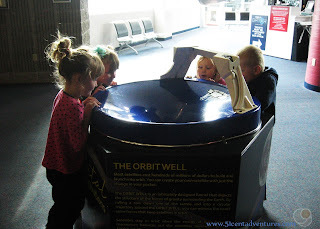 I'll tell you the answers as I tell you about our trip to the Cosmosphere. Right when we entered the building I knew we'd found a special place. They had an actual SR-71 Blackbird on display in the lobby. And right next to it was a replica of a space shuttle. This airplane is so fast it could have flown over the whole state of Kansas in something like 4 minutes. 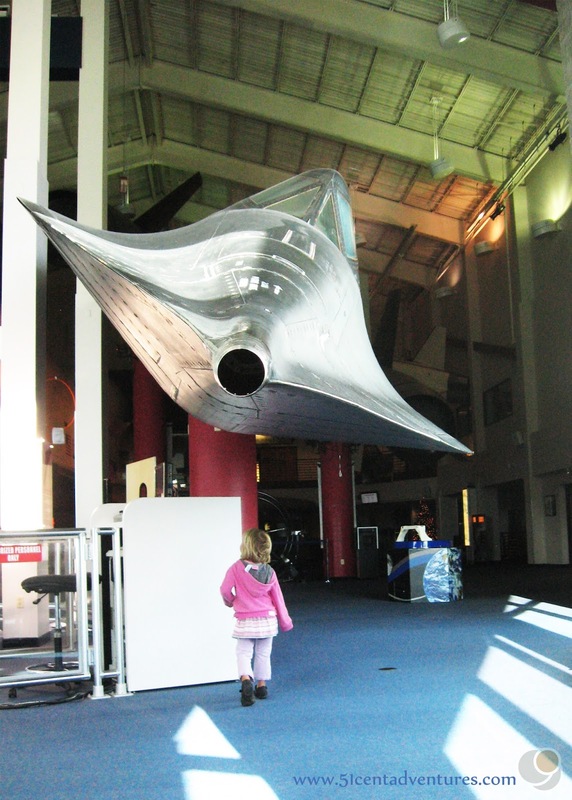 I love this picture juxtaposing the Blackbird with my three year old. She's something akin to a force of nature so it seems right that she could go head to head with a plane like this. We bought tickets for the museum. The Cosmosphere was the most expensive thing we did on this trip. Two adults and three children over age 3 came up to $57, but I felt it was worth it for us all to see the Apollo 13 Command Module. There was also an option to add special movies to our ticket, but our kids aren't very good at siting through movies yet. 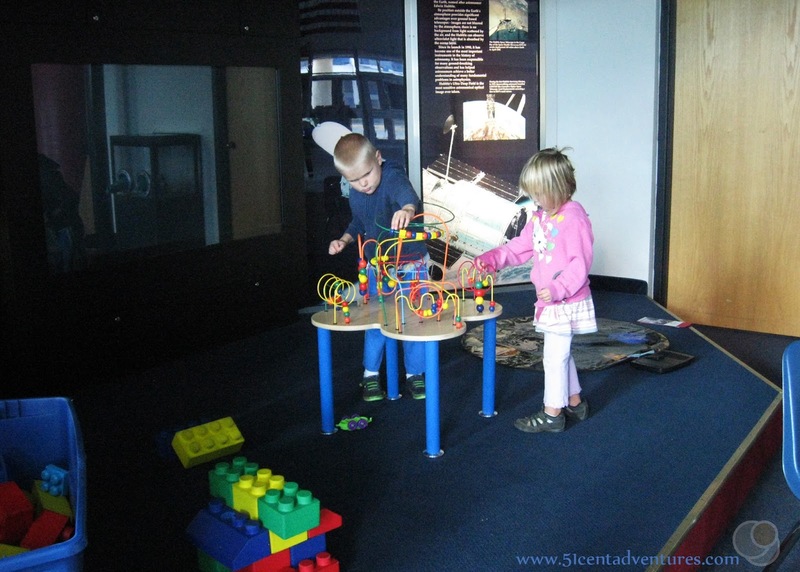 Before we went into the museum part of the building the kids had to play with the toys in the lobby. They probably would have been content to play in the lobby the whole time. 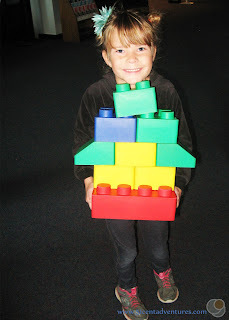 My daughter built a rocket. My two youngest can't resist a good bead toy. 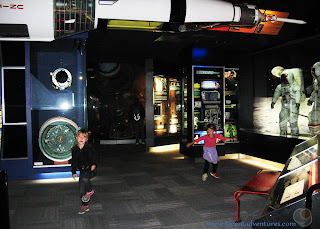 All the kids had to take a turn pretending to be an astronaut. Then it was time to go into the actual museum part of the Cosmosphere. 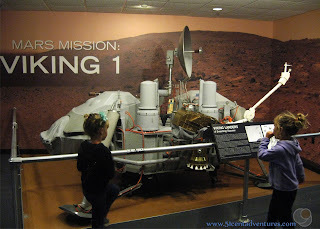 On our way to the entrance we passed a model of the Viking 1 that landed on Mars in July of 1976. This was just sitting in the hall on the way to the museum entrance. I figured if this is what was out in the hall then the actual displays had to be amazing. Before we entered the museum I found the answer to my first question. Why was this world class Smithsonian Affiliated Space Museum located in Hutchinson, Kansas? Well it was because of a woman named Patty Brooks Carey. And she is my new hero. In the early 1960's Patty decided that Hutchinson needed a planetarium. Through sheer will power and persuasiveness she made that idea into a reality. She raised money for a star projector and set up shows in an empty poultry house at the Kansas State Fair Grounds. She began educating people from around the area. Later the planetarium was moved to the science building of the community college. As the years went on the planetarium acquired more artifacts. and entered into it's affiliation with the Smithsonian. The name was eventually changed to the Cosmosphere. Thousands of visitors from all over the county come here each year to learn more about space and the space program. And it's all because Patty Brooks Carey had an idea and decided to make it happen. After reading about Patty it was time to enter the museum. We descended some stairs and passed under a stained glass window. The words say Ad Astra per Aspera - to the stars through difficulty. I expected this place to be just a few space artifacts surrounding the Apollo 13 Command Module. But instead they had hundreds of artifacts dating back all the way to World War II. The displays explained the very early days of rocket science. I could have spent hours here reading every information sign and examining each artifact. But let's be real. I was here with my kids. And they were all scared of the displays. I don't know if they were picking up creepy Nazi vibes or if they just didn't like the dimmer lighting. But ALL the kids were crying and asking to leave during the first part of the museum. They calmed down a little bit as we made it further in time. 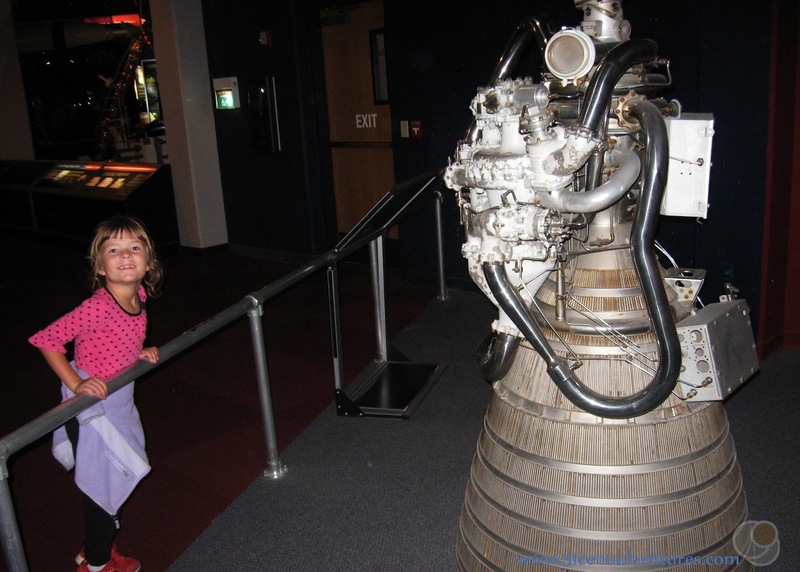 The museum had displays and artifacts detailing each phase of America's space program. But they didn't just focus on America. 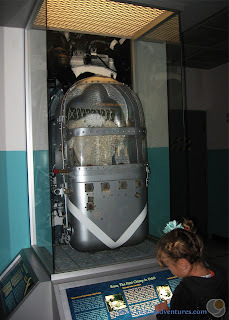 There were also many displays explaining the Soviet Technology from the same time period. We made it to the 1960's part of the museum where the Liberty Bell space capsule from the Mercury Space Program is usually housed. 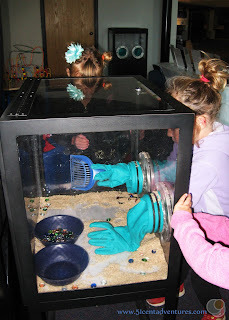 However, at the time of our visit, it was on loan to the Children's Museum of Indianapolis. Gus Grissom piloted this capsule when he was flown into space. When he returned to Earth his capsule landed in the Atlantic Ocean as planned. However, something went wrong and it quickly sank into the sea. 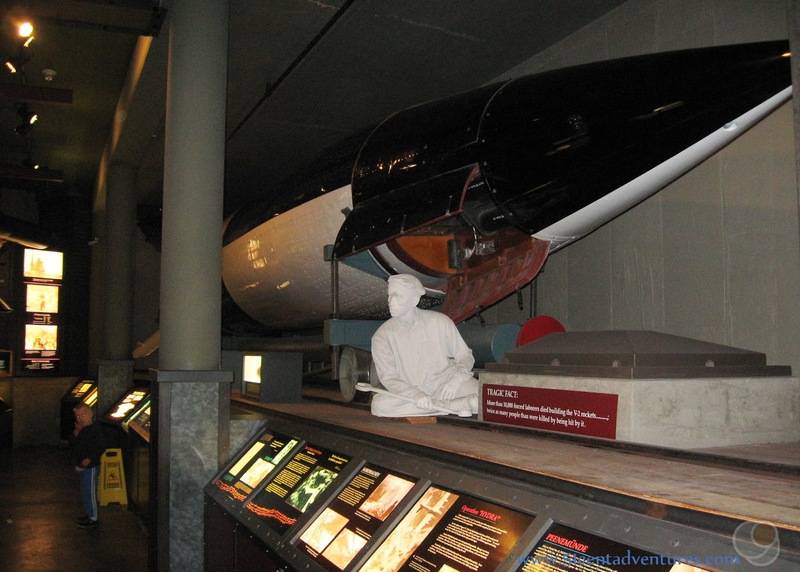 Gus Grissom was able to get out safely, but the Liberty Bell capsule was lost forever - or at least until 1999. Divers found the capsule and the Cosmosphere restoration team took care of restoring the capsule. Soon we went around a corner and entered into the Apollo era of the museum. This is what I had been waiting for. 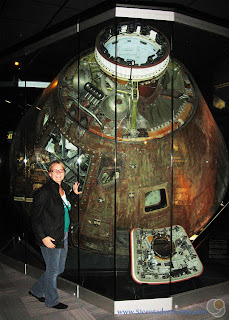 There it was the actual Apollo 13 Command Module. This is what brought Jim Lovell, Fred Haise, and Jack Swigert safely back to earth. 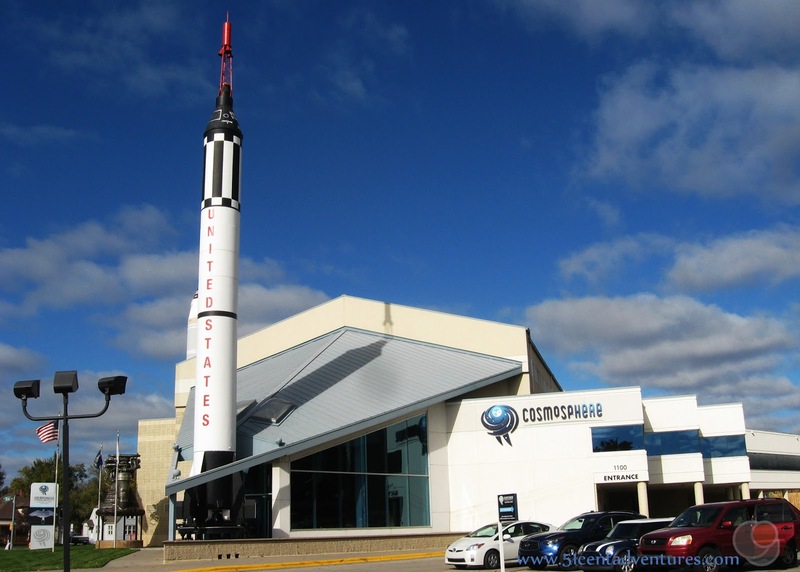 Years passed and the Cosmosphere started acquiring NASA artifacts for it's collection. 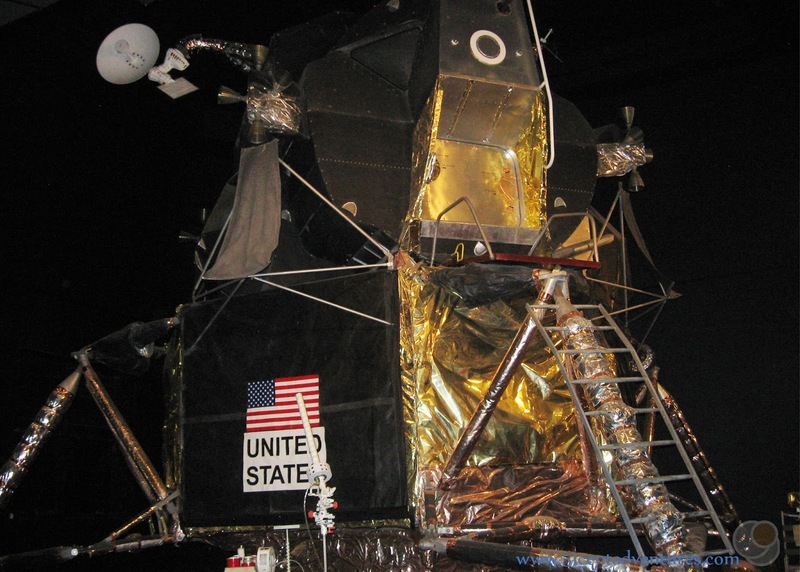 They discovered boxes full of parts that had been on Apollo 13. The directors of the Cosmosphere started the long process of getting the Command Module back from the French government, and then put back together. In order to put it back together properly the Cosmosphere used the talents of their Master Restoration Specialist - Greg "Buck" Buckingham. He took the literally thousands of parts and put them back into the Command Module to make it exactly how it had been on the day of launch. Thanks to his talents thousands of people are able to see the Command Module as it always should have been displayed. 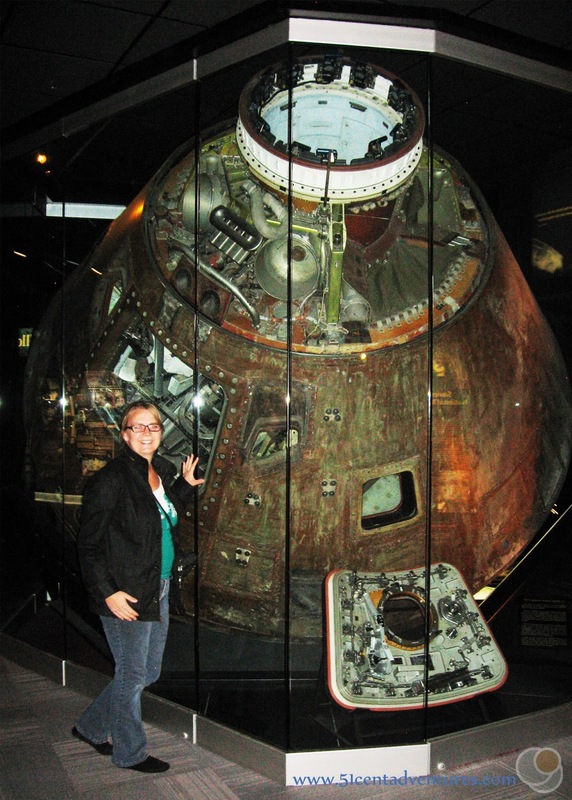 Of course the Command Module wasn't the only thing on display. They also had one of the famous "White Rooms" that was perched on top of the scaffolding next to the rocket. 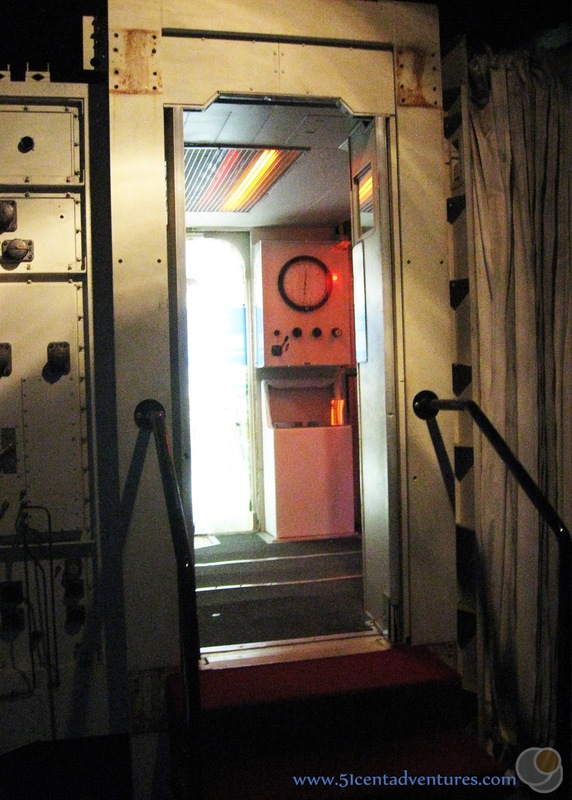 This is the last room that the astronauts would be in before they were strapped into their seats to prepare for launch. My kids had mostly perked up by this point and were excited about all the displays. They ran around pointing and shouting about everything. My daughter was so excited to point to this engine. There were scaled models of the lunar module and lunar rover. 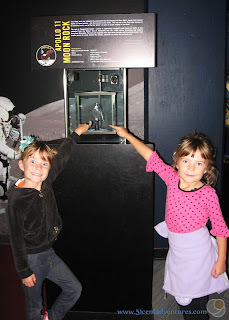 The twins' favorite part of the whole museum was this moon rock. The girls started pretending to walk on the moon. They liked hopping around on the grey floor. I was happy to see their interest in science grow. I've only posted a fraction of the pictures that I took. There were so many interesting things to see. I could have spent a long time in the museum, but the kids were getting antsy. So we went back up stairs where they spent another 30 minutes playing with the toys again. The twins were very interested in pretending they were scientists. When it was time to leave we put pennies into this orbit spinner. The kids' love watching the money spin. I love that they are so easily entertained. 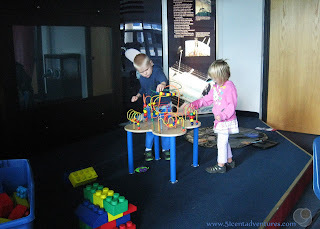 I think we spent 3 hours in the museum - at least an hour of that was spent playing with the toys in the lobby. If the kids were older we probably could have spent a whole day here looking at the displays in detail. One day I do want to come back her and spent more time. Recommendation: I've been to several space museums throughout the country (the US Space and Rocket Center in Huntsville, Alabama, Rocket Park in Houston, Texas, and even the Air and Space Museum in San Diego, California) but the Cosmosphere in Hutchinson, Kansas is the best. You can tell that a lot of care and time has been put into each display. In addition to the amazing artifacts there are great information placards near everything. These explain the significance of the items on display. Visiting the Cosmosphere is definitely worth your time. Directions: Hutchinson is about an hour northwest of Wichita and and hour and a half south of Salina. The best way to reach the Cosmosphere is to travel on KS-61 and then turn onto 11th Avenue. Travel west on 11th Avenue for about 9 blocks. The Cosmosphere will be on the right. You'll know you are there when you see the rockets out front. Additional Information: If you want to see more of the artifacts on display check out the excellent virtual tour available on the Cosmosphere website. 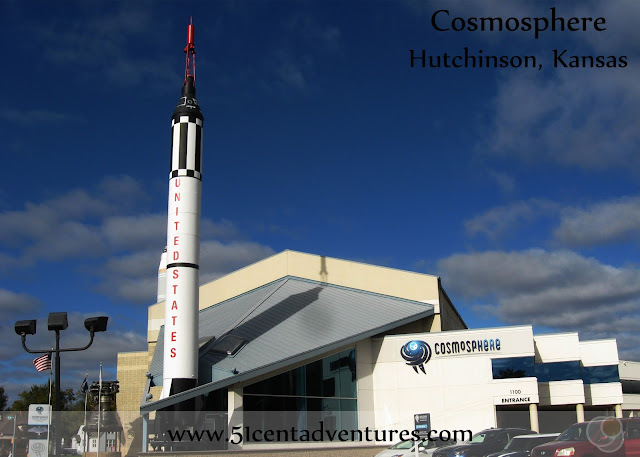 Places Nearby: Hutchinson, Kansas is also home to Stratica. This was an underground Salt Mine that has been turned into a tourist destination offering a cave/amusement/historical experience. Activities inside the mine include a train ride and a dark ride. Tickets are a little pricey at $19 per adult and $12.50 for children, but I might say they are worth it considering this used to be a salt mine and that's pretty unique. Unfortunately no children under the age of four are allowed to go underground at this location. My youngest just barely turned three so we had to save this for another trip.